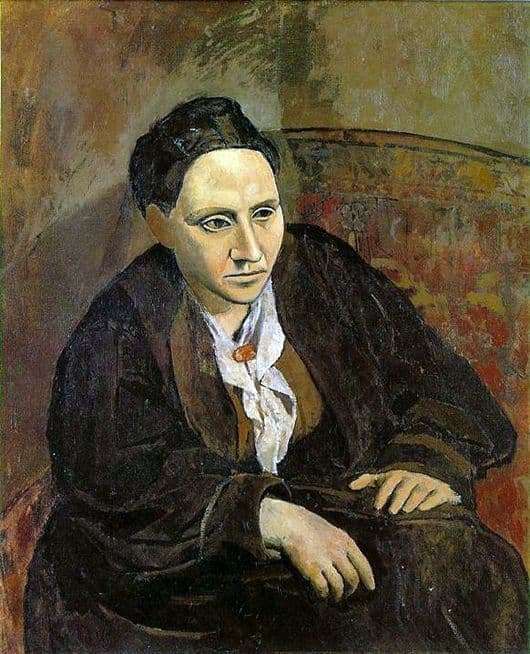 And how unhappy was Mrs. Stein when she saw the final version of her portrait, which she received from her best friend Picasso. First of all, she did not like the face. By the way, it is depicted in the manner of Picasso. Although in the first version, even when she posed for the artist, she liked her face more on the canvas. It is not strange, but Picasso spent quite a lot of time trying to portray his girlfriend and his philanthropist. The American Stein in her homeland was a fairly well-known writer, and then she became even more famous after she began to collect a collection of paintings by the great Picasso. But it’s not that. The fact is that Picasso, as a rule, never worked on portraits for a long time. It was necessary only a couple of sessions of posing, and the rest he drew from memory. Everything turned out differently with this canvas: she posed for him for more than three months and as a result – he quit his job, and it was never finished. A little later, being in a completely different place, he suddenly returned to the portrait and rather quickly painted a face. It was the face that became the stumbling block during the sessions of posing and became the reason for the refusal to work further. And then suddenly, from memory, swiftly and without interruption, Picasso finishes the portrait. When Stein saw the final version, she was upset. It is because of the face. But Picasso assured her that if now her face is different, then in ten or fifteen years it will be like that. And so it happened. Subsequently, she has repeatedly stated that this is the best portrait of her that she has ever seen. But what about the portrait? Mask. Mask-face, which shows the imperiousness of women and determination in actions. Actually she was so in life. Otherwise, she could not squeeze into the literary world of the United States. Only pushing with her hands, and biting into her enemies, did she manage to achieve popularity.